For other ships with the same name, see HMS Rosario. HMS Rosario was an 11-gun Rosario-class screw sloop of the Royal Navy, launched in 1860 at Deptford Dockyard. She served two commissions, including eight years on the Australia Station during which she fought to reduce illegal kidnappings of South Sea Islanders for the Queensland labour market. She was decommissioned in 1875, finally being sold for breaking nine years later. A team from Rosario played the first ever New Zealand International Rugby Union match against a Wellington side in 1870. She was the fifth Royal Navy ship to bear the name, which was first used for the galleon Del Rosario, captured from the Spanish in 1588. The Rosario class was designed in 1858 by Issac Watts, the Director of Naval Construction. They were built of wood, were rated for 11 guns and were built with a full ship rig of sails (this was reduced to a barque rig by about 1869). With a length overall of 160 feet (49 m) and a beam of 30 feet 4 inches (9.25 m), they had a displacement of 913 tonnes. These were the last sloops constructed for the Royal Navy to retain all-wooden construction; their successors, the Amazon class, incorporated iron cross beams. Rosario was fitted with a Greenock Foundry Company two-cylinder horizontal single-expansion steam engine driving a single screw. With an indicated horsepower of 436 horsepower (325 kW) she was capable of 9.2 knots (17.0 km/h) under steam. As designed, ships of the class carried a single slide-mounted 40-pounder Armstrong breech-loading gun, six 32-pounder muzzle-loading smooth-bore guns and four pivot-mounted 20-pounder Armstrong breech loaders. By 1869 the armament had been reduced to a single 7-inch (180 mm) muzzle-loading gun and two 40-pounders. From June to October 1862 she was employed in fishery protection duties in the North Sea. In October, she was transferred to the North America and West Indies Station, and cases of fever and smallpox were recorded in her in 1864 after visits to Kingston, Jamaica and Fort Monroe in Virginia. The strained relationship between the Union and Britain during the American Civil War did not prevent visits to American ports, but ships of the North America Station would also have used Bermuda and the Royal Naval Dockyard, Halifax as bases. 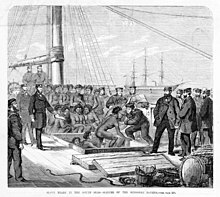 The Lyons–Seward Treaty of 1862 allowed for greater co-operation between the US Navy and the Royal Navy in combating slavery, and it is probable that anti-slavery formed part of her employment, particularly in the Caribbean. In 1866, she was ordered from Quebec to Montreal to provide protection to the harbour during the Fenian Raid of 1866. Sixteen members of her ship's company were awarded the "Fenian Raid 1866" clasp to the Canada General Service Medal 1866-70, possibly while serving as members of a Naval Brigade. After four years on the North America and West Indies Station she paid off at Chatham on 13 October 1866. Rosario recommissioned at Woolwich on 28 September 1867 under her previous captain, Commander Louis Venturne. Commander George Palmer then took command in October 1867 and under him she sailed for the Australia Station. On June the 4th 1868, Officers from HMS Rosario were entertained in Auckland, New Zealand by the Officers of the Royal Irish Regiment (the 18th): Daily Southern Cross 5 June 1868 Page 3. On 5 June the ship left Auckland for Tauranga, with his Excellency the Governor of New Zealand, Sir George F. Bowen on board. In 1869 Rosario detained the schooner Daphne on suspicion of "blackbirding", or the illegal recruitment (including enslavement) of the indigenous populations of nearby Pacific islands or northern Queensland. Commander Palmer brought charges at the Vice Admiralty Court of New South Wales, but the charges were dismissed by the Chief Justice of New South Wales, Sir Alfred Stephen, on the grounds that the British Slave Trade Act 1839 did not apply to the South Pacific Ocean. In 1870 a team from Rosario played the first New Zealand International Rugby Union match against a side from Wellington. It was intended to recommission her in Sydney in 1871, with a new crew being brought out from England in HMS Megaera, but with Commander Challis remaining in command. In the event Megaera became a total loss at the isolated St Paul Island, and her passengers were rescued by HMS Rinaldo and SS Malacca. There were no fatalities, and the new crews eventually reached their intended ships. The ill feeling against white men in Nukapu is easily understood; one of the vessels stopped by Rosario during the November 1871 cruise was the brig Carl, which had been the scene of a particularly brutal massacre. Markham was too late to find any evidence of the murder of up to 50 islanders on board (that came later when one of the crew turned King's evidence), but the activities of the ship in the area explain the aggressive attacks of the local population, and probably also explain the murder of the bishop. The measures taken by Rosario became the subject of questions in the House of Commons, and Markham's book on the subject may well have been prompted by them. The book itself makes clear that Markham clearly understood the cycle of violence and deplored both the murderous activities of the Blackbirders, and the apparent need for further violence in restoring order. In April 1872, once again under Commander Challis, she visited Wellington, Otago and Auckland in New Zealand. Her cruise of the later part of the year took her to the Solomon Islands, and was conducted entirely under canvas. The summer of 1874 was spent visiting Fiji, the Marshall Islands, the Ellice Islands and the Gilbert Islands, in part searching for William "Bully" Hayes, who was notorious for his blackbirding activities. Rosario picked up a number of his shipwrecked crew from Kosrae, but Hayes evaded the search. In 1874, she was employed as a prison hulk for young criminals,[Note 1] and on 12 October 1875 Rosario paid off at Sheerness after an eight-year commission. She is listed at Chatham in 1880, and on 31 January 1884 she was sold to Castle for breaking up at Charlton. ^ a b c d e f g Winfield, R.; Lyon, D. (2004). The Sail and Steam Navy List: All the Ships of the Royal Navy 1815–1889. London: Chatham Publishing. ISBN 978-1-86176-032-6. ^ "HMS Rosario at Naval Database website". Retrieved 14 November 2009. ^ a b c d e f g h i j k "HMS Rosario at William Loney website". Retrieved 14 November 2009. ^ Troublous Times in Canada: A History of the Fenian Raids of 1866 and 1870#Chapter XI. – via Wikisource. ^ "Coins and Medals" (PDF). Retrieved 19 November 2009. ^ "Telegraphic Summary for Europe and the East". The Argus. Melbourne. 19 June 1869. ^ Reid Mortensen (2000). "Slaving In Australian Courts: Blackbirding Cases, 1869-1871". Journal of South Pacific Law. 4. Retrieved 19 June 2007. ^ "News". The Argus. Melbourne. 27 March 1871. ^ a b "Arrivals". Otago Witness. Otago. 13 April 1872. ^ Clowes, William Laird (1997) . The Royal Navy, A History from the Earliest Times to 1900, Volume IV. Chatham Publishing. pp. 230–231. ISBN 1-86176-013-2. ^ Lawrence, David Russell (October 2014). "Chapter 5 Liberalism, Imperialism and colonial expansion" (PDF). The Naturalist and his "Beautiful Islands": Charles Morris Woodford in the Western Pacific. ANU Press. pp. 147–148, 152–158. ISBN 9781925022032. ^ a b c Markham, Albert Hastings (1873). The cruise of the Rosario amongst the New Hebrides and Santa Cruz Islands. London: Sampson Low, Marston, Low, and Searle. ^ "Biography of Albert Hastings Markham at the National Maritime Museum". Archived from the original on 9 June 2011. Retrieved 18 November 2009. ^ "The Rosario and the Murderers of Bishop Patteson". The Argus. Melbourne. 15 February 1872. ^ "The South Sea Islands" (PDF). Harper's Magazine. pp. 488–500. Retrieved 19 November 2009. ^ "Hansard, 11 March 1872". Retrieved 19 November 2009. Mr W Johnston asked the Under Secretary of State for Foreign Affairs, If there is any foundation for the statement that Her Majesty's ship Rosario has shelled and destroyed the village in the Island of Nukapu, in which resided the natives who murdered Bishop Patteson; and, if so, by whose orders this was done? ^ "Shipping – Arrivals". The Brisbane Courier. 11 January 1873. ^ Resture, Alfred. "Alfred Restieaux Manuscripts – Part 2". Jane Resture. Retrieved 23 March 2013. ^ "Cruise of the Rosario". The Argus. Melbourne. 7 November 1874. This page was last edited on 30 March 2019, at 05:16 (UTC).